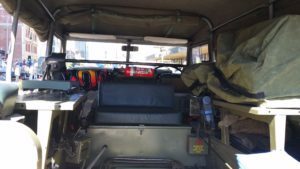 For Sale 1980 Series 3 Land rover FFR complete with radios mounted in there correct trays. The radio prc 25 is untested and the F2/F3 HF radio is case only but there is also the AMU HF Tuner and BBF1 Charger also the antenna mounts are on the vehicle two HF and two VHF with there own AMU but one VHF AMU needs replacing. The vehicle has had a lot work completed mechanically ie: Brakes completely replaced , all bushes under the body replaced also the gearbox has been completely rebuild with all new parts. All the invoices for all the works done is available. Included is about $1200.00 of spare parts and bits ie: Cam Net plus poles , 3 x Dist caps , 3 Rotor caps and more. Currently on SA Historical registration. The price is $ 20,000.00. Cash only. Will consider swap for similarly priced vehicle. Interested buyers only Contact John Jenner on 0439 551 173, or email john.jenner@bigpond.com. Kev Tipler organized another of his winery tours through the Barossa Valley on 21 April 2018. 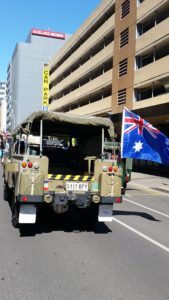 Originally we were to take our military vehicles, but unfortunately my Jeep was u/s due to a brake problem, so we decided to take our civvy vehicles. On what turned out to be a lovely sunny autumn day, we met at Williamstown Cafe at 0900 hrs for coffee and Marc Turner arrived in his jeep! We then visited St Hallett winery for tastings where we were well looked after by a staff member who was a friend of Kev’s. Next we drove to Pindarie for tastings, and were met by Tony Luke for lunch. After lunch Kev took us on a scenic drive including on some rough tracks to Jacob Creek’s Steingarten Vineyard on top of the eastern ridge, then on to another of Kev’s friend’s wineries at Liebich Wein for fortified tastings and finishing up a Tony Luke’s for afternoon tea. A really good day was had by all who attended. Well done Kev! 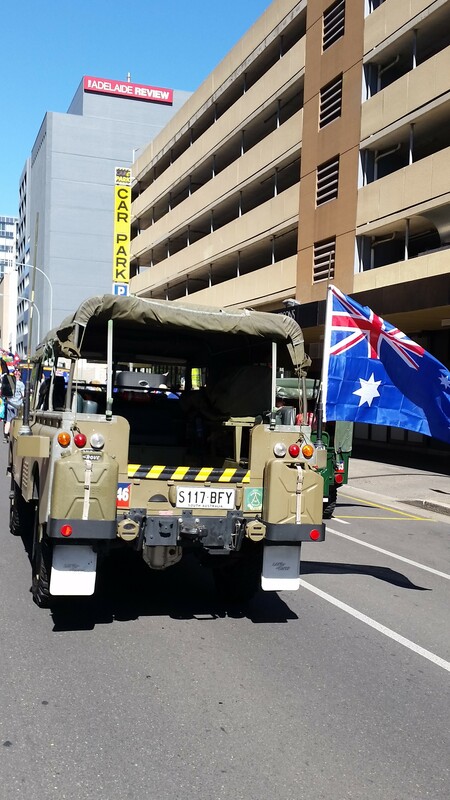 Would all members intending to provide vehicles for this Year’s Anzac Day parade please contact Mick Jenner, so we can advise the organizers of vehicle availability.